Japanese fast food chains have a special place in our hearts. They are the saviour of budget travellers, offering a tasty rice bowl, curry or noodle soup as an option to sushi trains when the yen is tight. When Yoshinoya closed on Oxford St in Sydney it seemed we would never get a chance to eat Japanese fast food unless we flew to Japan. Yet under our noses, waiting patiently for us while we ramen-ed here and soba noodled there, was Pepper Lunch, a Japanese food chain that hits all those fun, cheap and tasty buttons us Japonophiles crave. We kinda thought the food was going to be a bit fun-but-crappy, but it was surprisingly (almost disappointingly) good. And it's pretty healthy as far as fast food goes. A huge thumbs up from us. Unlike a chain store in Japan, this place has plenty of room. Seats are wrapped around inside and end up out the front of Menya Mappen inside the mall. You order at the counter on the way in, grab your number and they find you inside. The star of the show is the hotplate. This Beef Pepper Rice (small), great value between 2.00pm and 6.00pm only $5.95. It lands steaming hot on your table, finish the cooking yourself. Mix it all together and you get a lovely, peppery rice dish. It kinds of tastes like a peppery, home-made Aussie fried rice. Simple and good. J-Curry Beef Hamburger - $11. Is this the happiest curry you've ever seen in your life? Underneath the brown sauce lies a hamburger (or cutlet as they are often called in Japan) and cubes of beef. There is a generous serve of curry and a boiled egg makes up his big nose. Alison reckons the hamburger is delicious, Shawn reckons it's disgusting. Salmon and Cut Steak Combo - $14.80. This was was seriously tasty. The steak is actually real steak and real good. And the salmon takes Mr Shawn right back to Japan. Even more fish for Mr Shawn with a Salmon Pepper Rice Bowl - $11. He is turning into Cat from Red Dwarf. Fish! Fish! Fish! Miss Chicken loves any dish that has cheese where it shouldn't be, such as Kimchi, Beef and Cheese Pepper Rice Bowl - $11.50. But as we recently discovered, kimchi and cheese is magic, marvelous, weird combination that works, it gives a cheesy, spicy flavour that reminds us of nachos. Salad bar is a bargain for $3.00 with a meal, otherwise $6.95 on it's own. Excellent for folks in need of a cheap veggie hit. We snuck back and got a refill but we're sure it's only one go. 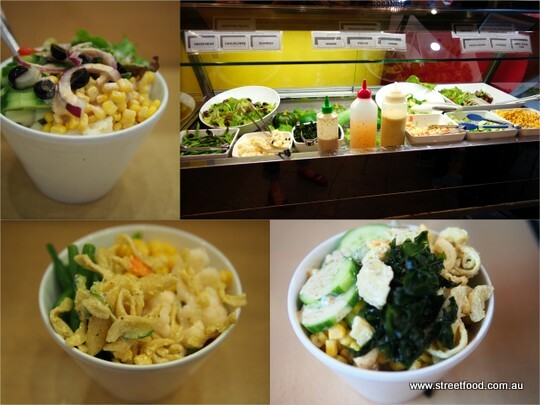 The bar has lots of cooked broccoli, cauliflower, corn, green beans, fresh lettuce, cucumber, seaweed, pasta salad and three different dressings. The sesame dressing is our favourite. Pepper Lunch is at 537-551 George Street, Sydney. There is another Pepper Lunch opposite the Entertainment Centre but is is slightly different. The two restaurants are listed on different websites www.pepperlunch.com.au (George Street) and www.pepperlunch.com/world/australia (Harbour Street). The latter one looks more like an official company website, not sure what is going on there... we wonder if it is a case of duelling franchise and company owned stores, like when we had Hungry Jacks and Burger King. Who knows. I've been here once and really liked it and should revisit with the BFF as we're looking for cheap places but places where out eating isn't over in 5 minutes. I don't think pepperlunch.com.au is an official website. As there are also outlets in Melbourne, Perth. There is also a clone called Stone Pepper Steak at Westfield Chatswood.